Introducing the UniFi Cloud Key, a miniaturised marvel of technology. The UniFi Cloud Key is an integrated computer and software controller minus the bulk. It features a quad-core processor with 1 GB RAM, operating the latest version of the UniFi Controller with built-in hybrid cloud technology. Breakthrough Efficiency The UniFi Cloud Key is fully capable of configuring and managing dozens of UniFi devices in your deployment. 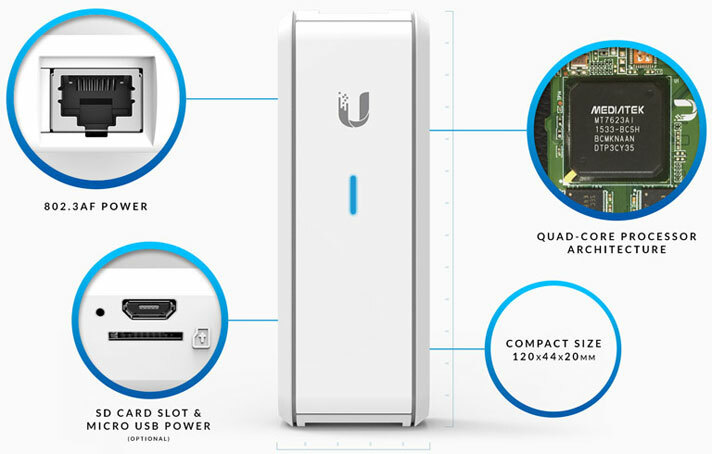 Replacing a dedicated server or computer, the UniFi Cloud Key is an ultra-low energy solution with virtually no footprint. Hybrid Cloud Technology The Ubiquiti® hybrid cloud configuration provides a secure, private SSO (Single Sign-On) to access all of your UniFi deployments from anywhere in the world. With the Ubiquiti hybrid cloud, a third-party hosted cloud service is not required, so all of your personal data and network information remains local and secure–the way it should be. The UniFi Cloud Key provides top processing power for centralised device management.